What’s the difference between feeding a chipmunk and feeding a goose? In Barrie, one is illegal, the other is not. Last year the City passed a bylaw wisely banning the feeding of wildlife, with the notable exception of well-maintained backyard bird feeders, because wildlife feeding causes many problems. It attracts animals that become habituated to humans, and can then be more aggressive. Their feces on our lawns and beaches can be a health risk. And the foods people commonly throw to them –bread, crackers, popcorn – is “junk food” not suited to their nutritional needs. But in their wisdom, Council restricted the bylaw to mammals; feeding ducks and geese is still permitted, although discouraged in parks. Yet this is one of the more problematic feeding issues. It is one thing to attract squirrels or raccoons to your backyard – you (and your immediate neighbours) will suffer the direct consequences. But feeding waterfowl at Barrie’s waterfront ends up despoiling the area for all of us who share this wonderful natural feature. As other cities like Mississauga and Oakville have shown, you can include waterfowl among animals prohibited to feed. Doing so is probably easier to enforce, too, because squirrel-feeding usually happens at home while duck-feeding is usually done in public parks and waterways. And even if the by-law isn’t aggressively enforced, visible signage can help reduce the harms. And the harms will become more apparent. Canada goose populations are at an all-time peak, and continue to rise. These geese thrive under human development, which actually provides more convenient spaces for them to live & eat than nature does. Their increase is most noticeable at the waterfront upon which rest so many of Barrie’s hopes for economic growth and amenity improvement. Do we want to attract more geese, and their poop, to the same place we are drawing people? Will aggressive geese and ducks make visiting the waterfront more fun? There are even some who feel it’s such a problem that the City should start aggressively reducing the goose population. In more rural areas, hunting them is permitted but I don’t think we want guns around our lakeshore. You can also destroy eggs or nests, or try to scare geese away periodically (usually with guns or aircraft – again, not great for our waterfront), or even have the birds relocated. But none of that works in the long term if we keep attracting them by feeding them junk food. There may be options for bird relocation the City would not have to pay for, which would be a good way to get a handle on the problem, but when it comes to dealing with nature, prevention beats a cure. We should learn to watch wildlife behaving naturally, which for geese means eating plants and seeds, not running after us to eat a scattering of human food. It’s not like there will be a sudden shortage of these common birds; they are very capable of feeding themselves and don’t need our help. So what do you think? 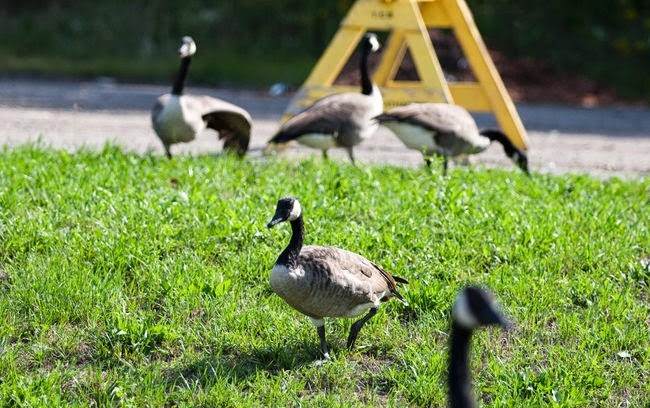 Should Barrie expand its bylaw to disallow feeding geese and ducks? Should we look into ways to reduce excess birds, by increasing suitable natural spaces away from the parklands maintained for human use, and trying not to attract them to the places we use? Should we be more aggressive in removing geese to other locations? As spring finally lets us return to enjoying a cherished green lakeshore whose amenity value grows with our own population, this is a conversation worth having. An accidentally-truncated version of this was published in the Barrie Examiner as "Should we keep feeding ducks and geese at the waterfront?" Definitely do not feed the geese. All the points you make are absolutely correct. Canada Geese are prolific and they are ruining their welcome in areas to the south where many migrate in the winter. There is just too many of them. Expand your bylaw to include the geese I would say. There is always more poop than geese, and there always seem to be too many geese. Foraging is Goodlfe fitness for geese.